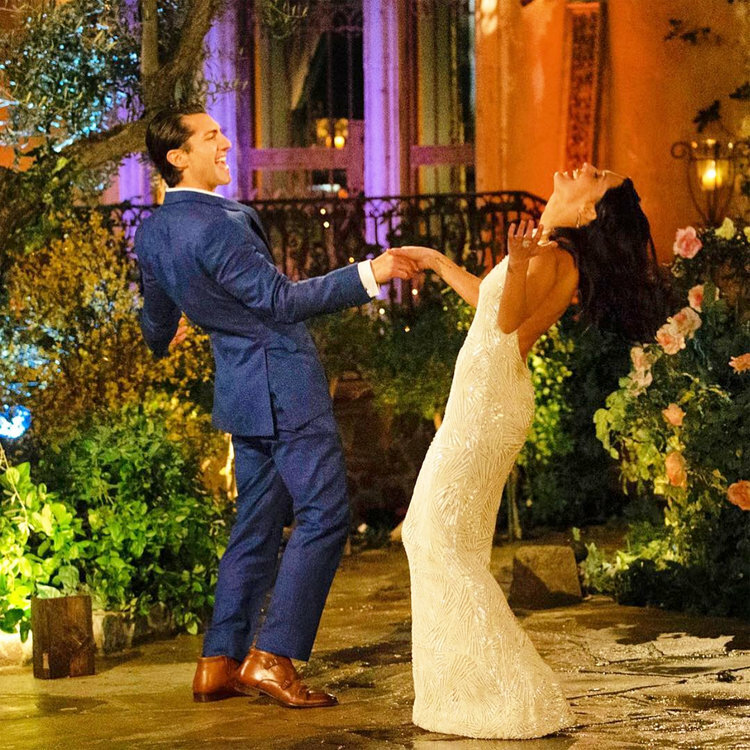 Geneseo alumnus Jason Tartick ‘10 dancing with Becca Kufrin (pictured above) on ABC’s “The Bachelorette.” Tartick made it to the final three of the reality television show, even becoming a fan favorite amongst avid viewers (courtesy of Jason Tartick). For this week's spotlight on an alumnus, The Lamron's copy editor Julia Skeval interviewed Jason Tartick. Tartick, who graduated from Geneseo in 2010 with a business administration degree, became one of the final three contestants on the most recent season of ABC's "The Bachelorette." This interview was transcribed by Skeval. Managing editor Malachy Dempsey edited and condensed the interview for clarity. Copy editor Julia Skeval: First, can you just tell me about your Geneseo experience? Jason Tartick: I graduated in 2010 as a business major. I was on Division 3 men’s soccer team and I was the captain my senior year, I was one of the captains on the team. I’m not really sure what clubs I was involved in—I was involved in some of the business clubs and things like that. In general, my experience was just phenomenal. I lived on South Side my sophomore year, before I moved out to the soccer house (56 Court Street) my junior year and then I lived in the Meadows my senior year. Just in general, I loved the professors, the sports organizations, the coaches of all the teams, the intramural programs, club programs, etc. I was very fond of just my whole experience. What I liked about it is that Geneseo is really in the middle of a rural area, the middle of nowhere. Creates such a strong sense of community and continuity and camaraderie amongst your peers, classmates, Greek life, athletics. Those are relationships that became so strong and will last a lifetime. Skeval: What else have you done since leaving Geneseo, career or otherwise? Tartick: I started with Key Bank in a management program right when I graduated from Geneseo and they recruited from the Geneseo business school. I worked in Syracuse for a year and a half and then I was promoted to work in Cleveland, Ohio at the corporate headquarters in a credit underwriting group. I was then promoted to work in corporate strategy in Cleveland. Then I came back to Rochester to work in the commercial banking group as a junior commercial banker. While doing that, I earned my MBA at Simon Business School in the University of Rochester in accounting and finance. What I will say is that the business school at University of Rochester is very fond of business students who come out of Geneseo. When working with the directors of the program, they clearly communicated how strongly they feel about the program and what Geneseo does. I graduated in 2016 and was promoted from a junior banker to a vice president and commercial banker. Then I was asked by the president of the bank to take a senior banker role in the commercial banking group out in Seattle. It made sense to move out there. I’ve been with Key Bank almost eight and a half years and I’ve relocated with them four times and I got my MBA from University of Rochester. Skeval: Do you think Geneseo prepared you well enough for the career you have now? Tartick: Yeah, absolutely. Geneseo does a good job of preparing their students in the classroom. The foundation of what the school promotes and pushes is just having a well-rounded base and a well-rounded foundation. That’s what liberal arts education pushes.The gen ed structure at Geneseo allows their students to be really well versed while having the reputation that they do, allows you to focus specifically in on what youre looking to achieve. The one thing Geneseo needs to do a better job of is marketing the power what the school does and instills in students. Having had the fortune to relocate all over the country, I’ve gotten to notice that our brand just isn’t powerful outside of New York. So that’s something we really need to be better at that. Skeval: Do you think anything at Geneseo prepared you for life on reality television? Tartick: We hard but we had fun. We worked hard and played hard. That taught me to overcome adversity in the classroom, overcome challenges on the soccer field and deal with the changes of life throughout the years of college. I think it also helped me build a strong emotional IQ. In reality TV, that’s a lot of what the bases are. It’s understanding life, understanding people, reading and reacting to situations and handling them with poise and confidence and composure. I think Geneseo helped teach me that and I don’t think a lot of the people on the show had that, as you were able to see if you watched the show. Skeval: Why’d you initially sign up for “The Bachelorette”? Tartick: I actually didn’t. Gilda’s Club is a Foundation that’s all over the country and I believe the founder was the family of Gilda Radner. She was a famous comedian on Saturday Night Live, who died of ovarian cancer. Gilda’s Club is a foundation that supports families and those undergoing cancer treatment. So I was asked by one of my buddies in Rochester to do what they call the Gilda’s Club “Bachelor Auction.” I was pretty involved in the community and what you do is you raise funds before you do this auction. Then they have this big marquis event where there’s 30 bachelors and people are bidding on dates with the bachelors and all the money goes to Gilda’s club. I ended up doing it and promoted it. I was able to raise the most money before the event and then at the event I was able to raise the most money there out of the 25-30 guys. I came out to Bob Seger’s “Old Time Rock & Roll,” and I had the American flag on an inflatable guitar, I was working the crowd a little bit. The video got sent to ABC and then in October I received a call from them. At that point I was 29, single and had just moved across the country, so I decided to pursue it. Skeval: Could you summarize your overall “Bachelorette” experience? Tartick: In summary, I would say my experience was phenomenal because I learned a lot about myself, I made friends with the cast. I was very fond of production and still have really strong relationships with Chris Harrison and all the producers involved. I really fell for Becca, Becca was an amazing Bachelorette and a better person. For me, I did some soul searching about myself. I came out of it a better person than I went into it. Just in general, I’m very fond of the experience. Skeval: Would you say it was more staged and planned by the production crews or do you think it was a pretty authentic representation of what happened? Tartick: That’s one of the wild things. Going into it, I thought it was staged or I was worried about my edit—will my edit depict who I am? And I got to say, going out of that, every person who I got to know had an edit that reflected who they are. In my experience, it wasn’t staged. Not one time did anyone tell me to say anything. People may have had other experiences, but for me I didn’t feel as though it was scripted. Now are there funny TV things you have to do? Yes. I think they show it on the bloopers: my mom and Becca get up and they go talk and they walk in different doors. For TV that look’s stupid, so they ask them to do it again. So there are funny TV things, but other then that I felt that the edit was a true reflection of who we are. I mean It’s reality tv and there wasn’t much planning or producing. Skeval: How was it being filmed constantly? Tartick: The first couple weeks it was challenging to deal with all the cameras, especially while having deep, intimate talks. After a few weeks, you got numb to it. By week three, I didn’t have a clue cameras were there. If you're comfortable on camera, you should be comfortable speaking in front of any audience at any time so it’s a good thing. Skeval: Were there any big over-the-top personalities on the show? Skeval: What has life been like post-“Bachelorette”? Tartick: It’s been crazy. I’m just a Buffalonian who went to school at Geneseo and pursued a banking career and didn’t expect any of this or foresee any of this. It’s been wild. You go from doing your day job to having meetings and talking to Ryan Seacrest in the studio. It’s just crazy but at the end of the day, all the support has been so appreciated. The important thing is that through the whole process and still to this day, all my friends and family have said the whole time I stayed true to myself. All the fame and the followers and all of the attention is endearing and flattering, but it’s also great to know that the person they’re supporting and rooting for is the same person I always am. I think there’s something about my message that resonates with people. I don’t know if its gay rights, career management, education, diverse family background, dealing with some difficult diseases like Alzheimer’s in our family, but I will say that something in my message resonates with people and it’s sparked some pretty cool dialogue. Skeval: How’d it feel being one of the fan favorites? Tartick: It’s pretty flattering and endearing. You don’t know what to expect. You don’t know whether people are going to hate you or love you. To see that everyone finds me to be an authentic, genuine person with a story that resonates is endearing and flattering. For me, I’m very thankful for all the support. I never expected it. I just stayed true to myself and it’s been really fun. Skeval: Have any friends from college reached out since the season aired? Tartick: I’m very close with a lot of my Geneseo friends, some I talk to every single day. I’ve remained connected with those friends and then alumni have reached out—people I didn’t go to school with, current students. A lot of messages, texts and calls have come through. If I see messages or meet people from Geneseo, they get my attention. Skeval: Did you ever see yourself being on reality TV? Tartick: I’ve always enjoyed singing and dancing, taking the mic here and there, so I guess I have a little stage presence in my blood, but I never saw it. I mean we’d joke around back in the day, like sitting around with the boys watching “The Bachelor” thinking “that’d be funny,” but I never saw it in my future. Skeval: Do you think you’re going to pursue any other reality TV opportunities? I know you just recently didn’t get the spot on “The Bachelor”. Any other things? Tartick: I would be very open to it on a situational basis, pending the purpose of the show and where I’m at in life. I was very fond of my experience—for me it was an unbelievable experience that I only look back on it smiling from ear to ear. So because of that, I would certainly entertain another one but it has to be right time, right place, right fit. Skeval: Did you ever think you would be the next Bachelor? Tartick: I was definitely approached by ABC for the opportunity and with open arms I would have accepted the opportunity. I think it got done to a few of us and they had to make a decision that was best for what they do and how they do it. Colton is a good friend of mine so I’m happy for him, but I definitely would have done it if they had made that selection. Skeval: Do you think dating life is different after having been on “The Bachelorette”? Tartick: I can’t really answer that since I haven’t started dating yet. I think it’ll be a little bit different. I’ve always taken a careful approach to who I date and I’ll probably do the same. There’s a lot of support out there. Skeval: How would you compare reality TV show dating to college dating? Tartick: I’ll say that I think college dating and real world dating are all very different. Just dating in 2018, there are so many venues and manners in which people date. This type of dating was a crash course. No cellphones, no Internet. I was fully immersed in the person you’re dating. There was something refreshing about being as dialed in to someone as you possibly can. One of the most powerful conversations I ever had in a relationship was the one-on-one date with Becca where we talked about her father having cancer and her father passing away and me doing the same about my grandmother. It was just a really deep conversation. The lack of distractions and technology allowed us to really dive deep into each other’s lives and see what shaped us to be who we are. Skeval: What advice in general would you give to Geneseo students now? Tartick: The advice I would give is to be resilient and adaptable in your approach to education and as you move in your career. Too many people today view their education and view their career as a blueprint. Today more than ever, It’s not a blueprint, it’s more of a mosaic. Build your brand, understand your passions and pursue it. A lot of people I’ve seen become unhappy with where they’re at over the years. They’re afraid to take those risks, they’re afraid to pursue what their heart is telling them to pursue and they’re so focused on a blueprint approach. In my opinion, that isn’t a formula for success. Be open, be resilient, be adaptable and look at your career as more of an art than a blueprint. Continue to take the risks and pursue your dreams because you’ve only got one shot at it. Skeval: Is there anything else you want to talk about? Tartick: A lot of these guys [on “The Bachelorette”] were models and pro-athletes. It was an honor to get Buffalo on the radar and get people talking about a small liberal arts school out of Rochester, Geneseo and people asking me about it. I’m honored in the fact that I could represent Geneseo and I’m flattered at the reaction of those who have gone to the school and know the school, that their proud of my representation. It was fun and we’ll see what’s next. Go Knights!